Great. Admission is the first step to recovery. 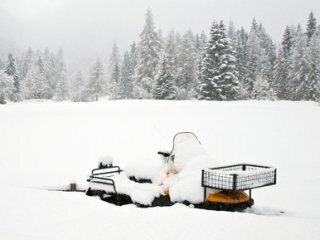 The second step is giving your snowmobile a once over to see what’s in need of some TLC to prevent your trusty steed from stalling out in the cold. Take the time to go over the simple operating functions first. For two stroke owners, it’s important to fill the oil tank to the proper levels. Four stroke owners should invest the time to swap out the oil and filter before heading out for the winter’s first adventure. Inspect the spark plugs and replace them in accordance with the manufacturer’s interval recommendation. In fact, while you’re out and about next time, it can’t hurt to pick up a spare set in case of a fouled plug early on in the year. Next, go ahead and peek in the fuel tank. Did you drain it? If not, and you didn’t add a stabilizer, it may be best to go ahead and drain the tank to start with a fresh batch of fuel for this season’s escapades. At the same time, check all of the fuel and oil lines for cracks, leaks and otherwise poor condition. Inspecting the exhaust and air intake cavities, as well as any other open space in the machine, is another wise move. After a summer in the garage, more than one snowmobile has suffered the wrath of angry mice who built their homes in your winter fun machine. Allowing any mouse debris into your motor can be a costly endeavor. Moving onto the electrical components of your sled, turn on the ignition and watch for any warning lights to illuminate. Give the machine’s wiring harnesses a good once over to ensure that wires are in good condition and securely attached to their respective destinations. Take this time to also test out your headlights and make sure that both the low and high beams are working properly. It’s better to be left in the dark in the garage than out on the trail. Replacing any dim bulbs now will save a hassle later in the season. Make sure the clutches and drive belt are ready to go by inspecting the drive belt for wear and tear. If your belt is starting to look raggedy now, there’s no sense risking its demise in the midst of a fun run. Shocks and other suspension components should be checked for proper operation, as well as any leaks or defects that will decrease performance and lead to an increased potential for component failure. Although these next two sound obvious, it’s often the items that stare us square in the face that we’re most likely to overlook. Number one: inspect your sled’s track by touching each individual lug. If multiple seasons of rough use, or a few late season rocky ride have left your track with loose lugs or protruding studs, it’s time to invest in a replacement. Snapped tracks during a ride can lead to dangerous situations that could be the end of you and your machine. Number two: take a peek at your sled’s pull start cord. If that little piece of string frays in two, you won’t be going anywhere fast. Invest the time and money to replace what needs replacing now, and you’ll be prepared for a winter of sledding without any breakdowns due to a lack of simple maintenance. As with any piece of motorsports equipment, taking the time to prepare your sled for a winter of fun is well worth the time, insult and injury that equipment failure out on the trail is sure to cause. Not to mention, it’s a great excuse to get together with friends, get excited for winter’s first big snow and enjoy a frosty beverage or two in anticipation of powder.